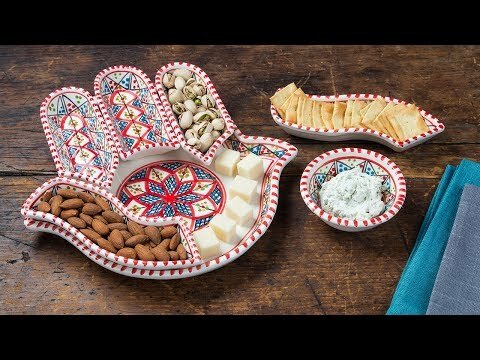 This handmade dipping set is made up of one large plate and seven smaller plates for dipping or serving. Put them together to create a bright, colorful sun. 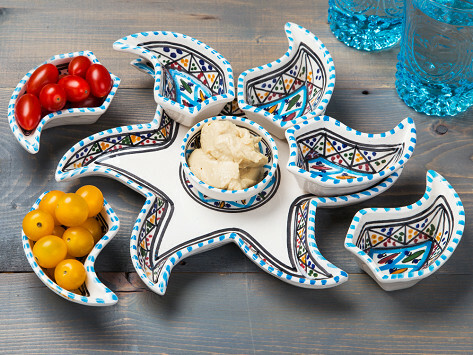 Each piece is made by local women for a fair wage in Neapolis, Tunisia, a city that’s been making renowned ceramics for centuries. And Kamsah supports the region even further, giving 10% of its profits to causes that benefit its artisans. Dimensions: Small: 4.5" x 7" x 1"; Large: 13.5" x 13.5" x 2"
Weight: Small: 3 lbs. ; Large: 5 lbs. I bought two- one for me and one for gift. I can't imagine what you would use the small one for as the large isn't very large.